For the cowboy ninja in all of us. #1 File of the Month for NOV10! Thanks everyone! 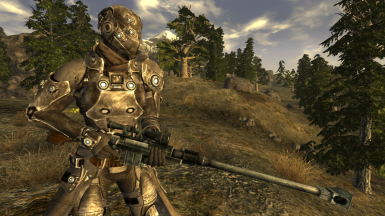 "RCSS" adds a reinforced version of the Chinese Stealth Suit to the Mojave Wasteland! 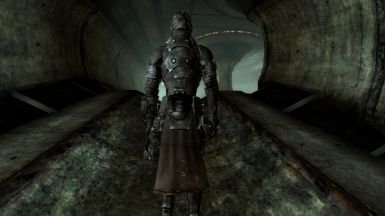 Like my original RCSS mod for Fallout 3, this mod implements a powered-up version of the Latexy Chinese Stealth Suit that resembles the likes of a popular futuristic Ninja. Peruse the images tab for a visual reference. 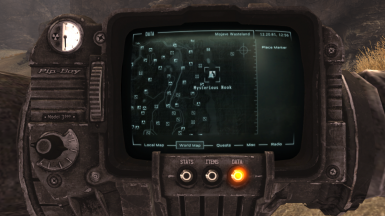 East of the Abandoned Brotherhood of Steel Bunker, on the far east side of the map, and south of the Hoover Dam, you'll find a "Mysterious Nook" near a cache of Lakelurk eggs. Upon entering the Nook, you'll trigger a small quest that'll lead you to a terminal. Check various logs in the terminal to find clues related to the location of several RCSS items. 1. 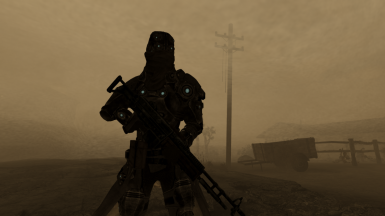 Drag Data over to "(Program Files)\Steam\steamapps\common\fallout new vegas"
The mod comes packaged with textures of my own, primarily to provide everyone with the nifty glow effects you'll see, but I don't want to restrict anyone to grey/blue. In the files section you'll find a variety of texture packs that can be downloaded as replacers for the original textures included in the main file. To install, simply drag and drop the desired texture file's Data folder (located inside the downloaded file) to your own Data directory and overwrite what was previously there. Simple! Note: The main file is still required! Q: While the stealth field is active, my character's hair disappears/causes graphical glitches, what gives? A: Game-related bug. The stealth field causes hair to suspend itself virtually anywhere it pleases. I've seen it attached to the Pipboy, the Sun, the entire Player Character, or my Weapon. 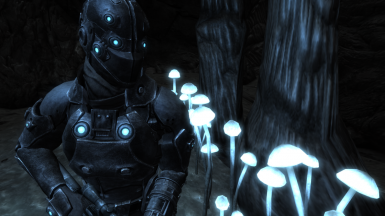 I've played around with different stealth effects with no foreseeable fix, so equipping a helmet seems to be the only way to go if things get too bad. Q: The item codes you have listed aren't working!? A: Try increasing or decreasing your mod index number, even if it doesn't match the one associated with the mod. Q: Things aren't showing up/Red Exclamation Points/Invisibility? A: Make sure you properly install the files to their appropriate directory. Simply drag the included Data folder over your own and overwrite any files that may be present. Q: Animation/controls/everything lock up when using this mod, what gives? A: Creating a clean save before installing the mod has been proven to resolve this issue! 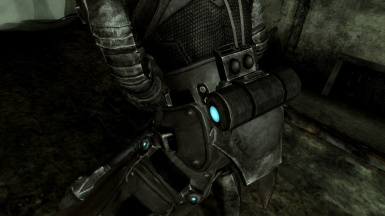 Q: The wrist is invisible when used with the Readius mod, can you fix it? A: I don't use mods like that, so its unlikely. Q: I can't equip X while using Y addon, can you make a patch so its compatible with Z mod? A: Nope, sorry. If you want things to match up with another mod, you'll have to jump into GECK/nifskope yourself. 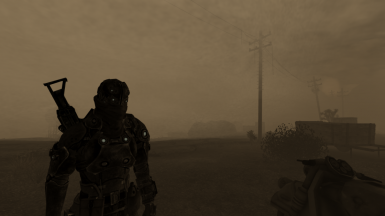 Q: Do you intend on adding NVSE functionality to the mod, for toggle stealth and night vision? A: Eventually, maybe. Right now I'm happy with its functionality. 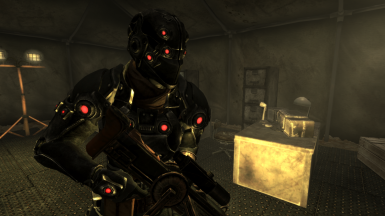 Q: Can you make a Night Vision version of the ATS visor? Or vice versa)? A: Swap the .nif files if you want this done. Each visor is intended to look and function a certain way. Q: What is up with the Waistguard (No Cloth)? It looks like you forgot to remove a piece? A: I didn't forget. 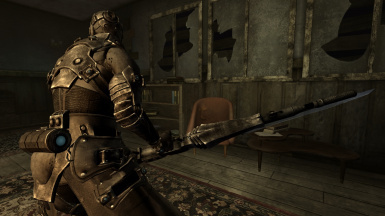 The armor is intended to be asymmetrical. Q: Why do the shoulder/pauldron armor float around when I sit? A: Anything in the game that has pauldrons suffers from this issue. A: I don't have much time on my hands, but I don't mind being given ideas/thoughts. By all means let me know what you think and what you'd like to see! Q: Why don't you let people redistribute/modify/release your stuff? Q: What is up with the characters in the mod? Who were they? Why do they have the technology? 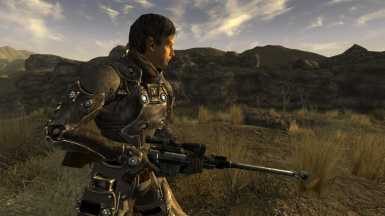 A: The FO3 version of the mod explains how Leo and AHJ ended up outside of Vegas. 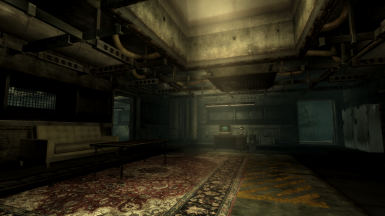 AHJ was an engineer for LOB Enterprises before the bombs dropped, and was involved in their dealings with the Chinese government. 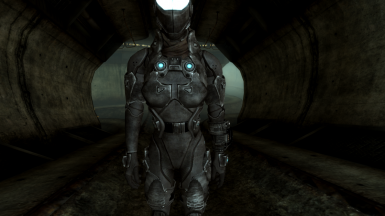 Her sole purpose in the company was to expand upon the stealth suit's functionality. She abandoned the company with most of the technology and presumably left behind what was available in the previous mod, wandering across the country with her husband (Leo) and daughter, and continued her research as they went. 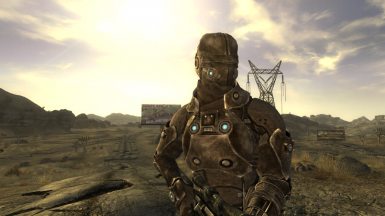 The NV version then explains what happens throughout their journey to the west. Thanks to YOU, for your consideration! Thanks to Kim, the love of my life, for letting me be myself! 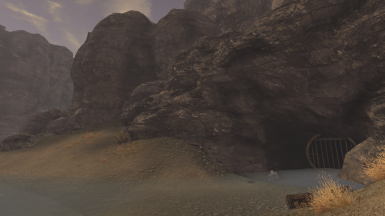 This 'port' of my FO3 RCSS mod uses assets from New Vegas, not FO3. I've done my best to follow the rules and regulations found on the Nexus sites, and will resolve any issue that may be found. Much had to be done to transfer everything over appropriately, so feedback is welcome if I didn't catch something! Also, redistributing ANY part of this mod is NOT ALLOWED. I will NOT give permission to change, modify, or include this mod in anyone else's project in any way. Modification for personal use is fine, and encouraged. 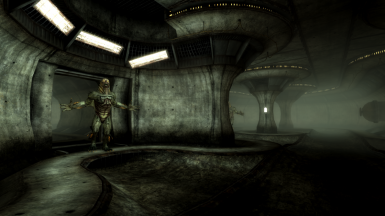 This file is NOT to be uploaded anywhere but the Nexus sites without my permission, as various characters, modifications, and game elements are the work of myself, Marshall Ashton, who holds intellectual property rights over portions of the included content (the derivative of which is owned by Bethesda). Check the FAQ section for details.